I don't always agree that bigger is necessarily better. It would be nice to live in a house, but I have a 1 bedroom condo. It would be nice to listen to music through a surround sound speaker system, but I have a computer. It would be nice to watch television on a projection TV that rivals a movie theater, but have a small flat screen TV. However, when it came to pushing my son (and soon to be daughter) around, I selected the biggest, baddest baby stroller I could find: the Baby Jogger City Select Stroller. And, nothing could be better. Everything about this stroller is big. And nowhere else is its presence felt more—than at the playground. It's the stroller that scares the children. It's the stroller that dads envy. It's the stroller that moms want to look at it, touch, and take for a test drive. And, apparently, it's features are meant to embarrass, rile, flaunt, and intimidate. The stroller is big enough to accommodate up to two children, using 16 different seat combinations, and adaptable for a car seat or bassinet. To be fair though, with big power comes big responsibilities. The price tag comes with a premium at $400 and, when folded, is the size of a preschooler measuring 28" long x 25" wide. But, its also considerably less and more functional than the Uppa Baby or other yuppie strollers of the world. I am fully aware that there are people who strongly dislike the mere thought of a monster motorcage meandering through sidewalks or shopping malls, but I am ok with that. This is my 4 bedroom house. My Bose speakers. My personal movie theater. And it's big. Really, really big. And, I wouldn't have it any other way. What is one of your BIG things? 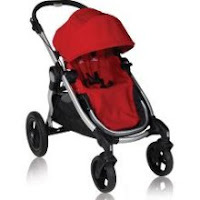 Its so funny that you call this a "big" stroller...you really must drive more double strollers on the market. Try parallel parking some of those beasts. We purchased the baby jogger city select cause it is one of the smaller double strollers that you can get and it offers 2 FULL size seats, a must for this twin mom. It really is and amazing stroller!